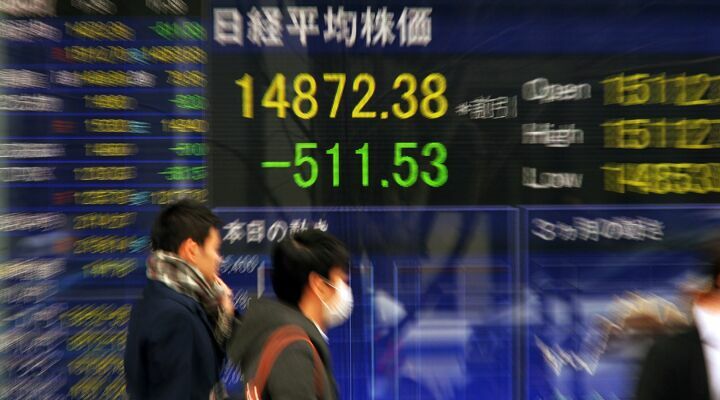 Financial earthquakes threaten to thrust the global economy into an abyss. Is there a culprit? America’s economic crisis is only half over. At least that’s the conclusion of Yale economist Stephen Roach. If Roach is right, it may be time to brace yourself. The world is shaking, and this time the emerging market powerhouses like China and India are facing their own reckonings. America is on its own—and a massive seismic activity could soon be unleashed. “[M]y advice is to keep the champagne on ice,” advises Roach at Project Syndicate. Some people believe the last two quarters of strengthening gross domestic product mean America is finally breaking out of its brutally anemic recovery. That’s just “wishful thinking” according to Roach. In Roach’s view, “American consumers’ balance-sheet repair is, at best, only about half-finished,” and the “healing process still has years to go.” Roach, known for his often gloomy outlook, is probably an optimist in this assessment. With the Federal Reserve now supposedly cutting back its artificial stimulus, debt servicing costs threaten to eviscerate U.S. consumers and shove the global economy back into recession. It’s true that personal debt levels have fallen. Due to the massive numbers of mortgage defaults and bankruptcies since 2008, the debt-to-income ratio for American households is now down to 109 percent, from the bubble peak of 135 percent in 2007. As Roach points out, this level is still extremely high—35 percentage points above the 30-year average of the final three decades of the 20th century. It is also true that people are finally saving more. The personal savings rate has increased from a pre-crisis 2.9 percent to 4.9 percent. But it too is far below the norms seen between 1970 and 2000. However, debt and savings levels don’t give the whole picture. The cost to carry the debt is more important. And the cost of supporting all that debt may be set to soar. In December, the Federal Reserve announced it would start to wind down its unprecedented stimulus programs. Since Federal Reserve money printing is the biggest factor keeping interest rates low and debt “affordable” for consumers, it didn’t take long before tremors began to be felt. Although the Fed said it would take it slowly, the news reverberated through the investment community. Within days, markets began to tumble and volatility surge. By the beginning of February, the Dow Jones Index and Nasdaq were both down 7 percent from their highs. The s&p 500 was down 5 percent. We are staring into the face of a “market bloodbath” unless the Fed halts its tapering, the Royal Bank of Scotland warned on February 4. At street level the ground is buckling too. Factory orders in the U.S. suffered their sharpest fall in 33 years this January. The ism manufacturing index plunged from 56.5 to 51.3, the biggest one-month decline since the Lehman crisis threatened to wipe out Wall Street. ing’s Rob Carnell called the news “absolutely awful”—and the worst since the recession of 1980. All those manufacturing jobs boasted about in the State of the Union address will disappear as if the Earth opened up and swallowed them. Meanwhile, America’s labor force remains trapped at a 50-year low, with millions of workers forced into early retirement or too discouraged to even look for work. According to the Telegraph’s Ambrose Evans-Pritchard, U.S. money supply growth rate has been slowing for months. Now that the Fed is reducing stimulus, money supply growth may be set to disappear altogether. This signals a “lull ahead,” he warns. Evans-Pritchard is being an optimist too. In a debt-based economy that mathematically requires ever greater amounts of money to cover principal and interest payments, even a reduced money supply can turn deadly. But so far, the biggest effect from the Federal Reserve’s taper announcement has been overseas. The brics nations (Brazil, Russia, India, China and South Africa) are now facing massive currency devaluations and foreign investor flight. If American consumers won’t be able to buy their goods, who will? So far, only China, with its massive $3.2 trillion foreign currency stockpile looks capable of resisting. But China has its own internal American-esque debt problems. Since the Fed’s December announcement, the Brazilian real has stumbled 4 percent against the dollar; Russia’s ruble has cascaded 8 percent; India’s rupee is down 1.2 percent; and the South African rand has dropped about 7 percent. These are massive distortions for currencies that usually move fractions of a percent. Only the Chinese yuan appears unaffected. Credit default swaps—measures of a nation’s ability to repay debt—among virtually all emerging markets are widening. The problem for Russia, Brazil and the other brics is that to prop up their currencies, they have to tighten monetary policy and restrict credit. That may be impossible without severely crippling their banking sectors and pushing their economies into recession. Other nations are shaking too. Turkey once bragged about avoiding the 2008 economic meltdown. On January 29, its central bank doubled its interest rate to stem foreign capital flight and stabilize the value of its currency. Since the Fed’s taper announcement, Turks have seen 10 percent of their currency’s value ground away. Analysts warn that the interest rate shock will shatter growth and knock the economy into full-blown recession. Protesters are already standing down water cannons in the streets of Istanbul over government corruption and Internet monitoring. Greek-like protests with burning cars and firebombs due to unemployment and sealed bank accounts may be next. On the outskirts of Buenos Aires, the flickering light of burning tires gives proof of the growing social unrest where week-long electricity blackouts are now common. Riots and protests are slowly constricting the capital city. From behind closed doors with iron bars, vendors fear looting will spread from the suburbs where striking police officers no longer patrol. Argentina has no one to blame for its hyperinflation and soaring unemployment. This is not the Federal Reserve’s fault. It is a socialist tragedy—nationalizing foreign-owned companies, restricting private enterprise, limiting free exchange of goods, telling people how much they are allowed to sell refrigerators for, printing money to finance unaffordable social programs—that has been years in the making. Yet Federal Reserve policy does not act in a vacuum. It may have pushed Argentina into the rift. The end of easy money from the Fed caused the few foreign investors left in Argentina to head for the exit. In January, Argentina devalued the peso by 19 percent. It then promptly outlawed all businesses from raising prices—under threat of prosecution. As a result, businesses are closing up and unemployment is rising. The black market, which doesn’t operate under the constraint of taxes and government regulation, is thriving. Nation-wide union salary negotiations are up next. Inflation is running at 74 percent. Things look bleak. The entire global financial system is propped up by the U.S. Federal Reserve money-printing. Now with the Fed slowing its stimulus, chaos is engulfing a world that has become dependent on easy money. The only way to mitigate the global wreckage will be for the Fed to reverse course and dramatically increase its monetary stimulus. By doing so, it might postpone the crisis and buy some time. But the Fed is a false god anyway. It cannot heal the world’s debt-addicted financial systems. It cannot re-create the global economy or even mend the economic fault lines tearing apart America’s own economy. But here is the irony of today’s situation. Back in 2008, the last time the world faced a global economic crisis, investors still fled to the U.S. for protection—even though Wall Street banks and U.S. policies were the cause of the crisis. It appears history is repeating. Will the world once again turn to America as a safe haven? Will this once again save America from its own financial sins and delay its day of reckoning? As much as the world hates the dollar, and hates American financial dominance, there does not appear to be a viable alternative monetary system. China is distrusted and faces its own debt problems. Europe is still disunified and fragmented. There is gold, but if even a fraction of global money flows moved in that direction, the metal would blast through $10,000 per ounce in a heartbeat. Even if the world does rush to America once again for safety, it will only do so in disgust and of necessity. U.S. economic policy has made big enemies for America. The world hates being whiplashed with every Federal Reserve whim. It hates the power of the Fed. It hates the power of America, the dollar and its reserve currency status. And it is working to find an alternative. When that day comes, and it is coming soon, you won’t want to be living in America for long.